Popular Japanese apparel brand UNIQLO will open its first shop in Thailand at the Central World shopping center in Bangkok on September 9th, 2011, after recent launches in Singapore and Malaysia. The store will be UNIQLO's largest in Southeast Asia, with a retail space of approximately 2,700 square meters, which will hold a vast collection of around 500 items of clothing for men, women and children. Two more shops are in the pipeline for Bangkok, at Central Plaza Ladprao and Central Plaza Rama III. The grand opening of the shop at Central World will feature some unique and limited edition items at special discounted prices during Sept 9-18, such as. - Men's Full-zip Hoodie for 790 B (regular: 1290). As a pre-opening campaign, there is a Uniqube Hunting Contest going on during the entire month of August, for participants to win prizes. Anyone can take photos of themselves posing with UNIQUBE cube installations at 9 locations around the city, and post their pictures on the campaign website www.uniqubehunting.com. Each day, 100 winners will get 500 Baht gift coupons, and 9 couples will win the grand prize of a free trip to Tokyo. Some of the Uniqubes are reportedly placed at CentralWorld, Siam Square, Platinum, J-Avenue Thonglor, and Chatuchak. With their simple, basic and solid styles and colours, Uniqlo's collections are designed to suit everyone. 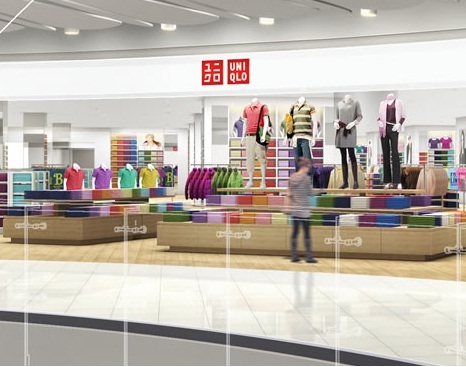 Uniqlo has gradually grown into a truly global brand with over a 1,000 outlets worldwide. Of course, most are in Japan, while over 160 of them are spread over other countries such as U.K., U.S., France, Russia, and several Asian countries.